The index opened flat and stayed in a narrow range with positive bias and saw huge short covering rally to end the day strong at 8869.10, gain of 59.75 points. The broader market was also strong, with 905 advances to 590 declines. Range as per Option Table stays at 8500-9000. Call option 9000-9100 added huge 7.11 lacs OI with short covering seen at 8800 and below strike prices. Put option 8900-8500 added huge 9.70 lacs OI with profit booking seen at 8200 and below strike prices. Nifty Open Interest is at 2,55,47,200 down by 5,01,075, whereas March series added 5.58 lacs with increase in price, most probably 100% rollover with small long build-up. Bank Nifty Open Interest is at 21,78,400 down by 37,500, whereas March series added just 9825 with increase in price, most probably small rollover with short covering. 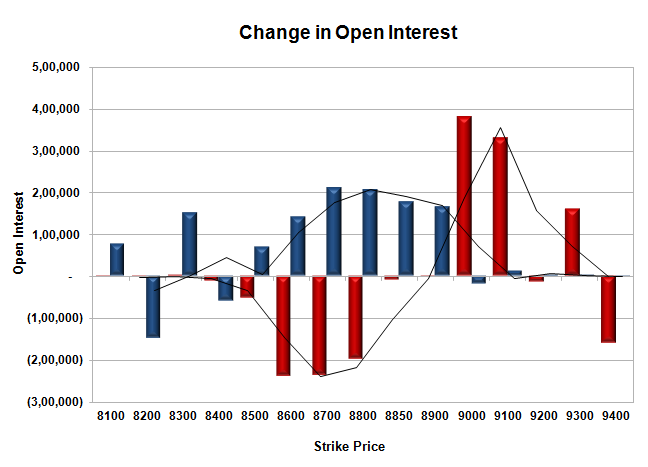 FII’s bought 2.76 lacs Futures, which includes 7395 contracts long build-up and 3647 contracts short covering, with increase in net OI by 3748 contracts (includes 44094 longs to 33052 shorts for the day) and the Average Price comes to 8885.89. FII’s Index future open contract as on date is 778842 Longs to 114963 Shorts, net long 663879 up by 11042 contracts. Initial support getting better at 8800, with OI of 38.28 lacs and below that at 8700 with OI of 37.42 lacs. 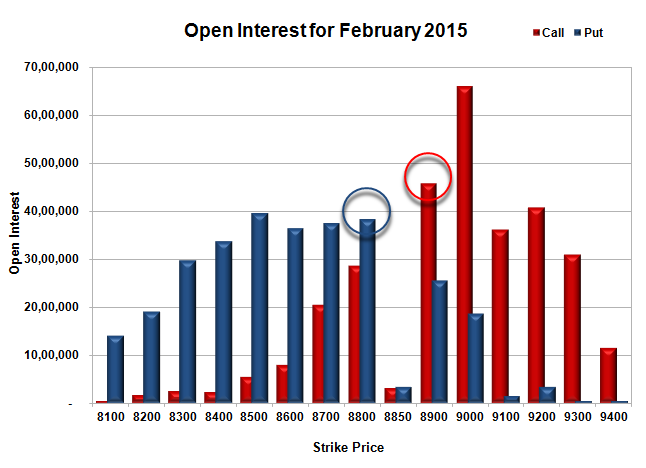 Initial resistance still at 8900, with OI of 45.72 lacs and above that at 9000 with highest OI of 66.13 lacs. 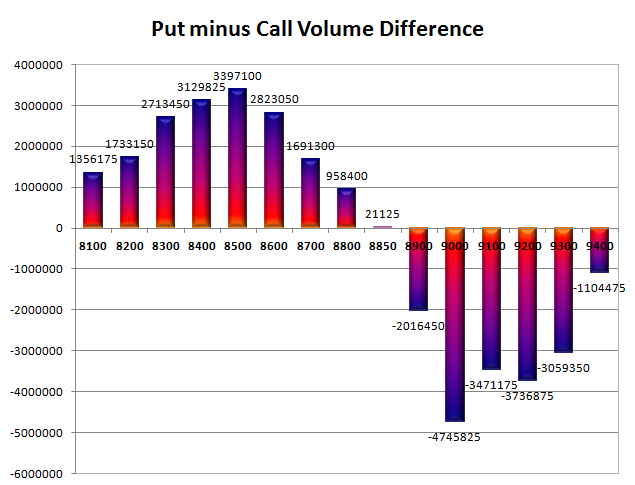 Day Range as per Option Table is 8777 - 8939 and as per VIX is 8772 - 8966 with 8857 as the Pivot.